Born in Lahore, Pakistan. 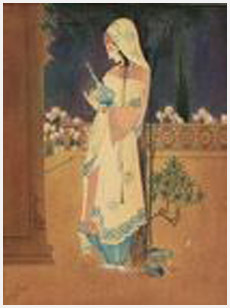 Maharani of Coochbehar commissioned him to paint a series of paintings on Ghalibs poetry. 1947 Designed the first letterhead of Pakistan. 1947 Designed postal stamps, insignia for Radio Pakistan and Pakistan Television Corporation. Founder member, Pakistan Art Council, Lahore and Karachi. Amal-i-Chughtai, published by him stirred revolution in publishing and printing in the entire region, it was gifted to many foreign Head of States. He was an avid Art Collector, he had nearly 300 original Persian, Mughal and Rajput-Kangra paintings. He designed the famous UNICEF card entitled Star. Founder, Alhamra Arts Institute, Lahore. Learnt to draw from his father Mia Karim Baksh. 1914 Diploma in photo lithography, Mayo School of Art, Lahore. 1932 Learnt print making techniques, London. Learnt etching under the guidance of Sir Frank Scott. 1936-37 Trained in etching, Central School, London. 1920 First solo exhb., Lahore Museum, Lahore. 1920 Punjab Fine Art Society, Lahore. 1920 Group exhb., Indian Society of Oriental Art, Calcutta. 1923 Exhb., British Empire Exhb., Wembley. 1931 Exhb., USA. 1937 Annual Exhb., Royal Academy of Art, London. 2004 Manifestations II, organised by Delhi Art Gallery, Jehangir Art Gallery, Mumbai and Delhi Art Gallery, New Delhi. Prime Ministers House, Pakistan. Presidents House, Pakistan. Governors House, of different provinces, Pakistan. Shahenshah of Iran, Iran. Queen Elizabeth II, England. United Nations Headquarters, New York. Peace Palace, Hague. Universal Postal Union, Berne. National Gallery of Modern Art, New Delhi. National Art Gallery, Islamabad. Chughtai Museum Trust, Lahore. Baroda Museum and Picture Art Gallery, Vadodara. Hyderabad Museum, Hyderabad. Sri Jayachamarajendra Gallery, Mysore. 1934 Received the title Khan Bahadur. He was given the title, National Artist of Pakistan. Original Chughtais paintings were gifted to all visiting Head of States. UNO art correspondent Jacg-baal-Teshuva wrote that Chughtais paintings are the most outstanding among the entire permanent collection of United Nations. Won Presidents Pride for performance award. He was given the title Hilal-e-Imtiaz for service to his country. The important element of Chughtais work is achieving a perfect harmony of line and expression. The delicate lines of Chughtais pictures are by no means insipid and shaky but firm and precise with a marvellous neatness and a most exactness of material. The figures of his paintings are lively and not merely beautiful designs. There are traces of emotion in the images and the gestures are with dramatic action. Chughtai was deeply fascinated by the facial expression of the figures of Mughal and Persian miniatures. His figures are mostly drawn in an attitude modified by the dignity of repose and tranquility. In Chughtais works there is a decorative element yet it is purely rational. The line work, the design element and the transparent layer of colours produce a pleasing atmospheric quality in their pictorial lyricism. Head-Instructor, Chromo-Lithography, Mayo School of Art, Lahore.